This recipe is from the America's Test Kitchen. I find that most biscuits are a little dry, and taste of baking soda. But these biscuits are extremely moist & flaky. Just what a biscuit should be. Unfortunately, they aren't so great for that New Year's Resolution that most of us made. Preheat oven to 425. Mix together dry ingredients. Add cream until it just comes together. Roll out on floured surface & cut into biscuits. Bake for 12-15 min. 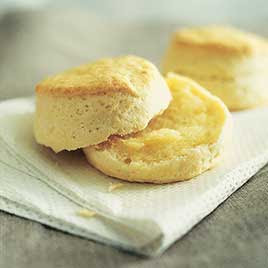 **The key to tender biscuits is NOT to over work them. The less you can work the dough, the fluffier it will be. I had these at Jess's house. They are awesome -- and they'd be great with the lentil soup (though they may cancel the Weight Watcher's aspect :) ).